Well, what a wonderful day. I should think Ray and Trish would have been gob-smacked when they heard that six women were descending on Banbury, Oxfordshire to meet Shirley's and my mutual second cousin Ray. I've always known about Ray because our respective fathers and their mothers used to correspond since my dad and his mother came to Australia in 1925. I met the "girls" at their apartment off Oxford Street at Marble Arch (how central), and we set off, on Ray's advice to Marylebone Railway station where we caught a train to Banbury an hour and a quarter from London in Oxfordshire, north. Ray met us at the station with his car, and the overflow followed in a taxi. Ray and Trish had booked a table - in a private room - at a local pub, and their daughter Tracey, who has a bad bout of laryngitis (and sounds like me, except for the accent) joined us as well. So there were nine of us altogether. Shirley and Ray shared their memories, and it seemed that Ray's parents and aunts were very concerned about what had happened to Shirley after her mother had died of kidney failure in 1942. Like many men, her father was not family minded and Shirley was brought up by his parents, and contact was lost with her mother's family. So it was not until 2009 until the jigsaw was completed. I'm so pleased that Ray had shown me (in 2008) that photo of Shirley as a little girl. 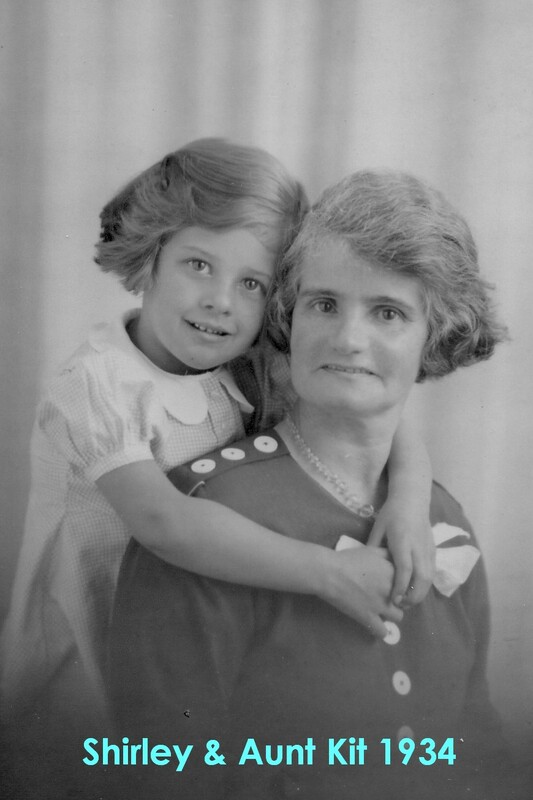 When Shirley saw the photo she remembered her great aunt Kate, who brought up her mother Kathleen from a young age. Kate was married to Sidney Bellenger, and all the Reed sisters called them "Steak and Kidney". Shirley was four and a half in this photo. She reminds me of Elizabeth's daughter Carolina who I met just last week in Orange County. How serendipitous that Shirley and her daughters from Florida and Tennessee were in London at the same time I was! I gave both Shirley and Ray copies of the latest family story I've written up. This one is about our 3 x great grand-father John Rose. Lucky he didn't end up in Australia as a convict (he was constantly being fined and imprisoned for his political activities in the 1830s) or we would be somebody else or never would have existed. Tomorrow I'm joining my girl cousins for a tour of the Tower of London. After that I shall try and see the Dickens Exhibition at the London Museum. They fly home on Saturday, and I'm off to Sussex to revisit my second cousin Linda on the other side of my dad's family. Marg, it is great that you met up with all your cousins, and were able to show them your book on their ancestor.